Technology returns to the fore with the AC72 wingsail America’s Cup catamaran, capable of regularly exceeding speeds of 30 knots. The catamaran will be able to fly a hull in 5 to 6 knots true windspeed. The target boatspeeds in winds under 10 knots were set at 1.2 times the true windspeed upwind and 1.6 times true windspeed downwind. High speeds are derived from enormous power. The AC72 has a righting moment of approximately 60-ton-meters. Determining the sail plan dimensions was difficult because the boat has to be powerful in light winds and not overpowered in stronger winds. The height of the wingsail will be approximately 40 meters (130 feet) with a maximum chord length between 10 and 11 meters (32 and 36 feet). Onboard cameramen will be carried during racing. 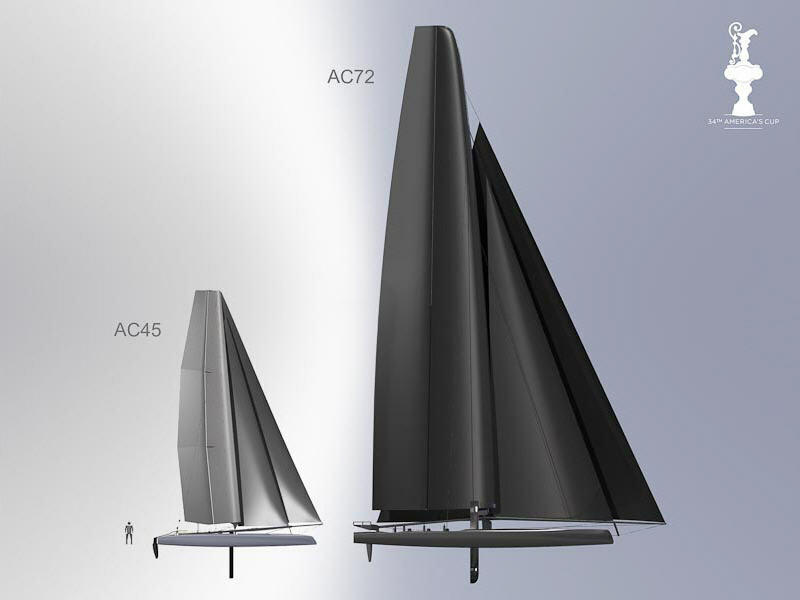 For more information on the competition class see New America’s Cup era begins with wingsail catamaran. For information on the America’s Cup in general see http://www.americascup.com/.